The RSL stereo ribbon from French company Prodipe is a slimline design housing two ribbons positioned on top of each other at a 90-degree angle. A number of similar stereo ribbon mics are on the market, but what makes this one interesting for me is its price point. 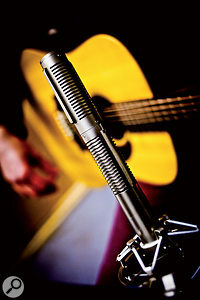 This type of mic is one you would normally associate with established ribbon microphone companies like Royer and AEA — and they normally come with the price tags to match those companies' reputation for high-quality products. I myself own a Royer SF12, which I use on almost every session at my studio, and given that Prodipe's offering is around a sixth of the price, I was very intrigued to see how it would fare. On a basic level, stereo mics can make your job as an engineer easier. You get two matched capsules perfectly positioned relative to each other, so that all you have to do is find the best-sounding place in the room to position the mic. 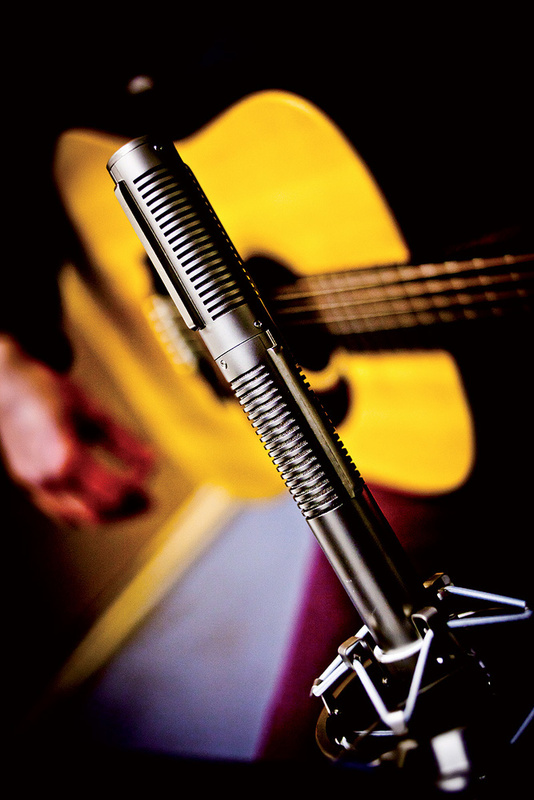 The arrangement that the RSL uses allows the mic to be used in a Blumlein configuration, which involves two figure-of-eight-pattern capsules set up to point 45 degrees to the left and right of the 'centre' of what you're recording. This configuration is associated with an excellent 'real-life' quality in the stereo image it can capture, and this, coupled with the reputation of ribbon mics for natural-sounding recordings, should start to give you an idea of what this type of microphone is about. 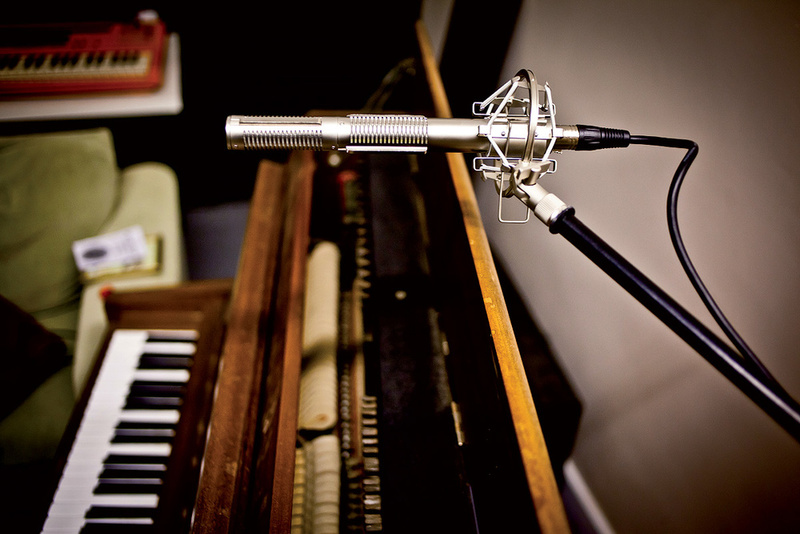 It's a popular choice for classical and orchestral recordings, or any job that might require a realistic stereo image, such as drum overhead placement, piano, a vocal group, or any room mic or ambient application. In the right room (and with the right source, of course), they can produce spectacular 'you're really there' results. The Prodipe RSL comes supplied with a good-quality hard case, which also houses a shockmount holder and the stereo XLR lead that is needed to connect the microphone's single five-pin output to your separate left and right XLRs. You can, of course, use either side of the microphone in mono, if you like, which is very useful. On first inspection, the mic's appearance and build quality seems good, and it has a stylish, light-sabre look and feel to it. The quoted frequency response for the RSL is 30Hz to 18Hz (quite high for a ribbon), with the response graph showing a slight dip between around 150Hz and 500Hz, another dip at 1.5kHz, and then the expected roll-off above around 10 to 11 kHz. Prodipe describe the RSL as having an "ultra-tough ribbon”, which means that the maximum sound pressure level is quoted at an impressive 140dB. 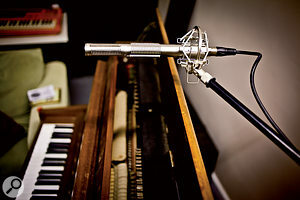 The Prodipe RSL was put to use on an acoustic piano recording, as well as on acoustic guitar, electric guitar and drums. I wanted to try the RSL for a number of the applications in which I usually use my Royer ribbon, including drums, piano, acoustic guitar, group vocals and hand claps, and electric guitar cabinets, and I ended up using it on a number of real recording sessions in my studio. Probably my favourite use for my Royer SF12 is as a drum-room mic, positioned a few metres back and looking at the kit. This was the first job I tried the RSL on, and my initial impressions were good. The mic is clearly a little brighter than your average ribbon, as the specifications suggest, but with a little positioning I was able to capture a very nice image of the kit in the room. It seemed to lack some of the lower-mid 'thump' that I associate with ribbons on drums, though, and I found that, with compression applied, I needed a little help from a low-pass filter to reduce the brightness of the the cymbals. Come mix time, however, and with a little more help from EQ, it was a useful part of my drum sound for the project, especially in the less cymbal-heavy parts. There was also a very good stereo image, with clear positioning of the widest aspects of the kit. I've successfully used the Royer SF12 as a drum overhead too, especially with drummers who like to hit the cymbals loudly. Combined with a few spot mics on hi-hat and ride, it can give you great control in the mix. It's also great having all the individual drums in phase in your overheads, which can make things very full and punchy sounding, so I was keen to try the RSL in this role too. I actually arranged a shoot-out type of setup between the RSL and the Royer for this test, and there were very noticeable differences between the two models. I could really hear the Prodipe's 'smile' response curve, with its extra high-frequency response and slightly reduced lower mid-range compared with the SF12. This was nice in a way, but it did make the recordings sound less like they had been made with ribbons, and as I'd made the call to not use condensers, this felt a little bit like defeating the object. I say this as someone with a few overhead options at his disposal, though, and I think the RSL would be more than capable of achieving very usable results if you were looking for a slightly brighter overhead sound. I also used the RSL to complement a close-mic ribbon setup on an acoustic guitar recording, for a client who wanted a Jake Bugg retro-type sound. I loved it in this application, and as a stereo room mic it provided a major part of the final sound. With the close mic, I was getting quite a boomy sound, as the figure-of-eight pattern of most ribbons is particularly prone to the proximity effect, but the extra brightness of the RSL (which was set back from the source by about two metres) provided the perfect foil, and it helped me to achieve one of the best recordings I've done in a while. On a simple piano recording, I found the RSL unfussy and very usable. I had to turn up the gain on the preamp quite a bit, but the noise was very manageable, and comparable with that of my Royer. Again, the stereo image was clear, with a nice spread and a good balance of low and high notes. In the same session I also captured a really nice stereo hand-clap recording, with four people spread around the microphone. Aside from the miracle of having four people who could sort-of clap in time, I was impressed with the realistic stereo field, all four people's positions being easily distinguishable. When used as a close mic on a guitar cabinet, the RSL was solid, if unspectacular. It can certainly take some volume, though: I cranked up the amp but lost my nerve before I could hear any deterioration in the sound from the mic. The RSL reminded me little of my Beyerdynamic M160 in this application, which I like a lot and often use together with an SM57 to achieve a full guitar tone. I mostly record bands and solo performers, and bearing in mind the relatively high cost of my current stereo ribbon, I see it as my one luxury microphone. I do some piano recording, and on the right female vocal it shines, but quite often I go through periods of time where its main use is as a heavily compresed drum-room mic. I was suitably impressed with the RSL for my mind to wander into what I could buy with the change if I swapped it for the Royer, and what I would miss! I definitely had to use more EQ and take more care with positioning the cheaper microphone, but I concluded that the two ribbons were fairly different beasts, which I would use in different ways once I'd got to know the RSL better. Modern, tougher ribbons are great: it's nice that you don't have to treat them so gently, and the extended high-frequency response is great on certain applications, but I wonder at what point you lose the essence of what makes a ribbon a ribbon? I think serious classical or orchestral recordists would probably stick to the more established ribbon or condenser choices, but the RSL would certainly make a relatively inexpensive and useful 'other option'. For band recordists and studio owners like myself, looking to expand their microphone collection, and who don't own a ribbon or stereo mic already, the RSL is well worth considering, as I found it at least usable on everything — and sometimes very impressive. At the much higher end of the market are the Royer SF12 and SF24, while AEA's R88 and the Coles 4050 go for slightly less. Mid-market options include the Peluso SR14 and Sontronics Apollo, and at the budget end are the Cascade Fathead II and X15. Works well on a wide range of sources. Slightly brighter than most ribbons. Anyone who wouldn't normally have the budget for a stereo ribbon mic will be pleased to know about this remarkably affordable yet good-sounding model.